Imagine that you could design and build the perfect toys for young children. Would the toys be playable, provide hours of fun, have learning value, appeal to both girls and boys alike and have a safe, quality build? They ought to. It might be best to start with a concept. Most children enjoy a toy truck, whether a fire engine, cargo, tipper or dump truck. What if you could design one frame with wheels and a variety of colorful, interchangeable parts such as a cab or cargo deck to build any of four truck models. James Barber and Luke Barber hand build a line of EcoTruck products in their toy factory aptly titled Luke’s Toy Factory in Danbury, Connecticut. These unique toy trucks share the same injection molded composite frame of about 5 3/8 x 2 inches, with a groove along the perimeter. Their concept is the theme of such a novel design and provides the basis for their puzzle building educational toys. Children find the available parts easily align and fit into the groove, and allows their imagination to build any truck in the multitude of available colors. As play events held at the local public library have shown, both girls and boys share a keen interest in the toys and creativity always prevails. Back in 2012 former commercial photographer James Barber launched his concept to repurpose end of life materials such as rice hulls into a viable component with which to build useful and durable toys. Rather than discard such waste products into the local landfill, James reasoned, the science must exist to reintegrate these natural and safe byproducts into raw materials. A visit to the National Plastics Exposition proved him right. Apparently a mixture of sawdust and nontoxic plastic provides the right composite formula to extrude parts that are both thicker and more robust than plastic alone. Not to mention the lower cost and abundant availability of flax shive, walnut shells, paper and coconut shells. So while the first four models of trucks are molded from furniture factory sawdust and plastic, upcoming models are molded from a mixture of renewable biomass such as rice hulls. This lends a smooth texture and natural coloring to the components of the toys and projects their EcoTruck branding. It also explains their philosophy to design and build safe, durable products with educational value. Luke Barber develops the prototype of each and every toy with modeling CAD (computer-aided design) software and a very clever imagination. While it might seem simple to draw a round pod or cylinder for a tanker truck, often the simplicity is lost on those who build the actual toy truck. It was found that young children placed the halves of the cylinder end over end on the frame, rather than end to end. Luke designed the most elegant solution to solve the problem. From a conceptual point of view, the procedure to produce a new model from their imagination to the package at the local toy store in quite complex and involved. Every toy component design must first have a prototype built. So a three-dimensional design file is sent to their printer which layers a thin filament into the sought after form. The prototype is tested for usability. Does the part fit as intended and more importantly, do children use that piece to build their toy? Is the truck easy to assemble? If not, a redesign is justified and a follow up prototype is fabricated. The prototype is next shown to the injection molder to gauge whether the design parameters are reproducible in a finely machined steel mold. Close tolerances might be hard to shape, and could clog the injection mold itself. Luke builds elegant simplicity into every design for practicality sake, production schedule feasibility and consistency of quality. The typical injection mold is employed to produce millions of parts, and whether shaped by EDM cathode methodology or just hardened carbide steel bits, the time required to deliver the mold is about three months. Under the heat of a screw drive that pushes tiny pellets of sawdust and plastic into the injection mold, those raw ingredients melt to become a frame or cab of the next toy truck. Rather than paint the parts, color pellets enrich the molded parts with a hue of green or red, yellow or blue. Future products might use renew-able organic yet previously disposable by-products such as flax shive or walnut shells which lend muted shades of warm brown or tan to the toys. I could easily imagine a Whole Foods logo on the cabs. Next the piece must not fail the choke tube tests. About the throat size of a child, the CPSC (Consumer Product Safety Commission) designed tube is used to judge whether any component of a toy presents a choke hazard. The tube measures 1.25 inches in diameter and from 1 to 2 inches in length. So every tire on every toy truck must be larger than the minimum choke tube diameter. Other safety hurdles involve a drop test, sharp edge test, finger entrapment test and material safety test where components are burned to emit gases then subjected to analysis by spectroscopy. Such lab tests discover unwanted ingredients, if any, such as lead. The final safety tests involve the energy on impact test and noise or decibel level test, if applicable. Quite a procedure. Lastly, the parts suppliers ship the components to Luke’s Toy Factory for assembly. Right now each and every axle is heat fused to their matching wheels by hand. Whether a tipper, dump, cargo or fire truck, the component parts are packaged into their vibrant cartons. Even their package is produced from recycled paper and plastic. So kudos to Mitch Achiron for both their package design and logo. Evan Achiron provides their social media presence and public relations. In terms of their future, James Barber shares their ambition to develop four channels of sales; the educational market, co-branding, business to business and, of course, the small retailer market. Luke’s Toy factory hopes to present their innovative EcoTruck products to Kaplan, Inc., the education company. That assuredly is very prescient and highlights their educational package four pack which contains one of each model toy truck, the total collection in one place. While available in about 200 stores coast to coast, the small retailer market is most robust in both New York and California. Of course, any of their toy truck products are available online via their website. Their vision with the most insight is the co-branding with Waste Management. To that end Mr. Barber presented a green dump truck with the embossed WM logo on a truck cab. A behemoth company now wants to promote programs to recycle formerly discarded trash or end of life wastes. How best to communicate their initiative to manufacturers, or educate young students about the importance of protocols to recycle or enhance the viability of farms with sustainability of reusable organic products? Simply display your company logo on a toy truck produced with sawdust. Or better yet, with flax shive or coconut shells. It made perfect sense. From the basic concept to develop a line of toys which present a “solve the puzzle” approach for young children, to the design of future products that foster a sense of sustainability, if only one company at a time, the Barber family epitomizes the dream. The entrepreneurial drive to grow their business with educational toys designed and built in their Connecticut workshop. 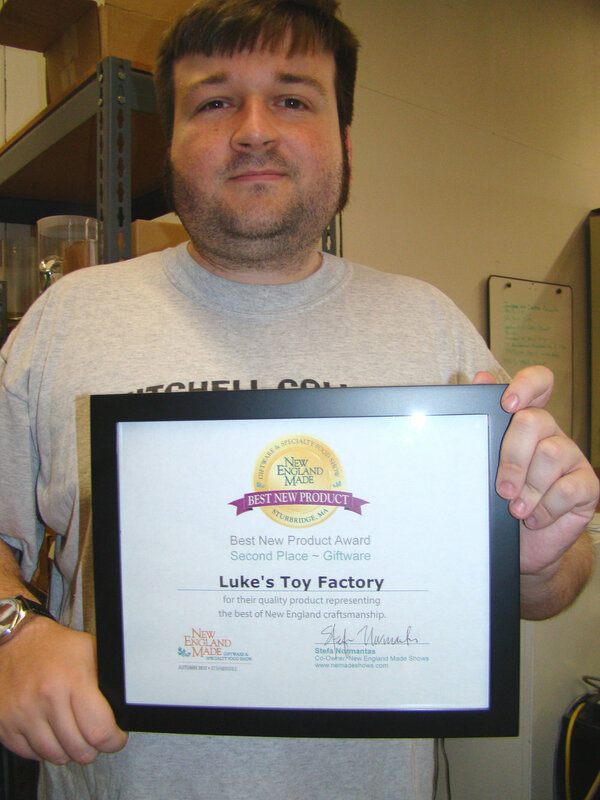 Luke’s Toy Factory earned the 2017 Best New Product Award from New England Made – Giftware and Specialty Food Shows. A prototype tractor-trailer design on their workbench captured the interest of this writer. Not to mention a stake bed truck with detachable sides. Plus renewable or future sustainable organic products might find their way into upcoming production models. Who could say? Luke’s Toy Factory produces a range a toys to engage the imagination of any child. Future plans include their expansion in four markets with active participation in trade show exhibitions along with regional toy fairs. Their positive reception by children who eagerly assemble their toy trucks points to a bright and maybe even lucrative future in the highly competitive toy truck market. So creativity and innovation are alive in a small workshop in Danbury where toys are hand crafted one at a time. Imagine that.